Visit Indy & Google Tours. Visit Indy is Indianapolis' appointed team who tirelessly promote our city at all levels and we're thrilled that You Are Here Photography has officially partnered with such an awesome movement. Visit Indy does more than go around and tell people how rad Indianapolis is, they increase tourism, boost our economy, and are avid supporters of everything local. It only made sense to have a sit down with Visit Indy and talk about how we can help contribute to those numbers with our services as Google Trusted Photographers. Think about it. Google Virtual Tours are a sure way for visitors or locals who are unfamiliar, get familiar before even landing w/in our state's borderlines. 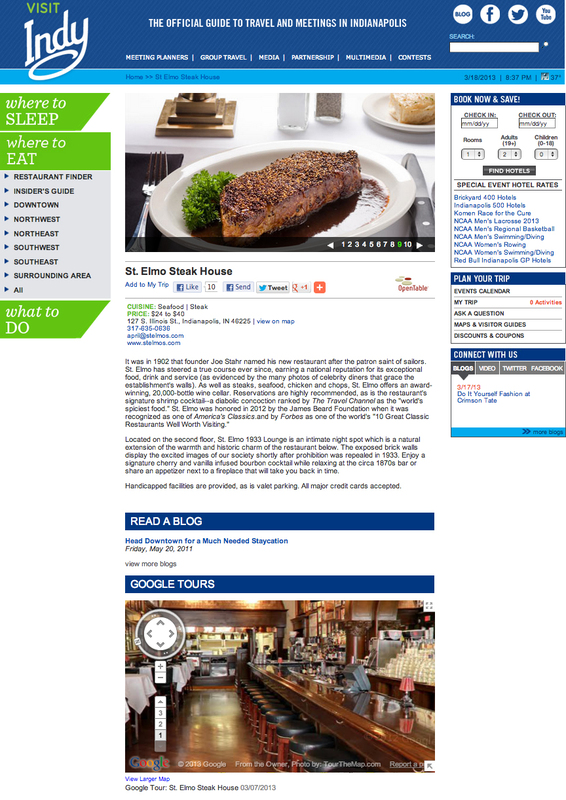 Yes, most of us who live here know about St. Elmo Steak House, but does a Canadian here on business know about St. Elmo Steak House or our other secret gems? I think they ask Siri who then probably checks with Google. Check out how Visit Indy integrated our Google Virtual Tours on their website.